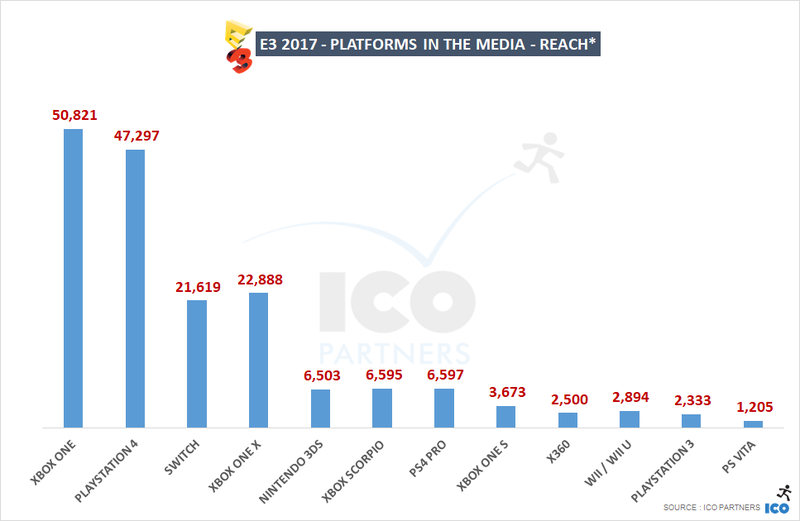 First, looking at the biggest players at E3, the console manufacturers, in many ways this was an interesting year in light of their performance at previous E3's. Nintendo, on the other hand, has had its best E3, doubling the coverage they got last year. The Switch is clearly a commercial success and is also popular with the media. With a smaller lineup than its competitors, it is quite the performance for them. The wider 3rd party program, with Ubisoft's partnership at the forefront, is likely a significant contribution. Sony. The conference wasn't mind-blowing, and the media coverage reflects this, but I think Sony was just playing it safe. There have been enough PlayStation exclusives to come out ahead of the show to allow them to message the console as the better alternative in terms of catalogue. The numerous VR games shown was a great reminder of the PlayStation VR, a strong differentiator when compared to other consoles. My biggest issue with the event was the format. It was hard to understand if the pre-show was meant to be considered as part of the main event - and many of the more interesting projects were revealed there. I will also note that during the show, the dates of this year's PlayStation Experience were announced. This is a strong message that PSX is becoming the main press event for Sony, and I wouldn't be surprised if they've held back a number of high-profile announcements. Nintendo. The numbers are quite telling - this was the best E3 for Nintendo in years. They were coming off of the back of an excellent launch for the Switch, and announced a number of high-profile games that are coming out very soon for the console. In terms of short-term hype, this was brilliantly executed. I am still somewhat confused by the Pokemon and Metroid Prime 4 announcements - they are likely to hype a core fanbase, and have the risk of setting expectations beyond what is being developed. I find announcements of this type are better done with something to show in order to frame what is being put together. But who knows with Nintendo? They may well knock these titles straight out of the ballpark. 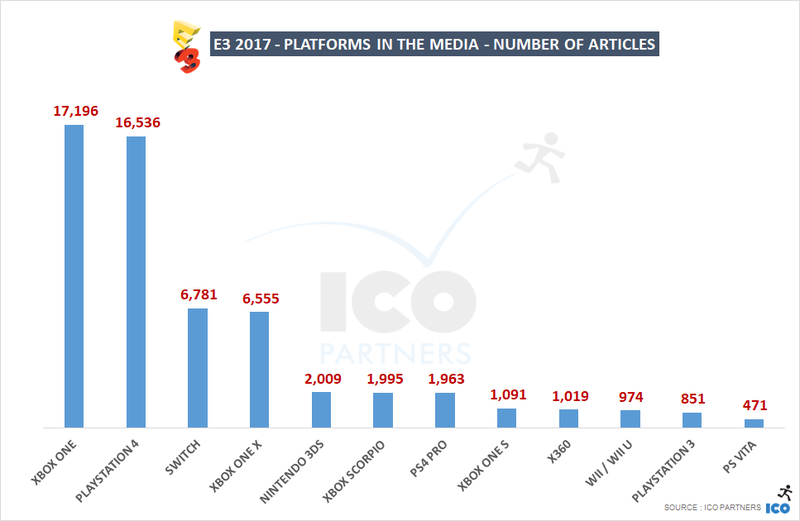 The Switch got more coverage than the Xbox One X last week - which is impressive considering the higher profile of the Xbox brand. Also impressive: the 3DS is still getting a decent amount of coverage. Again, PSVR is leading. 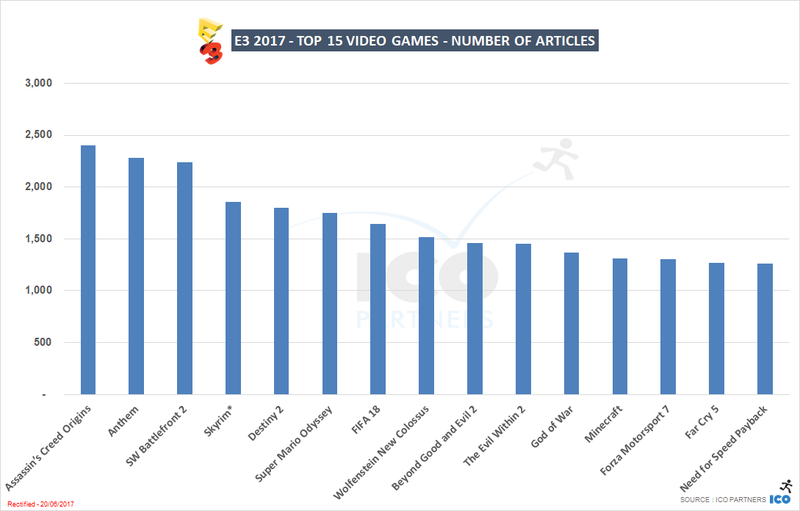 But, there were about half as many articles as at last E3. 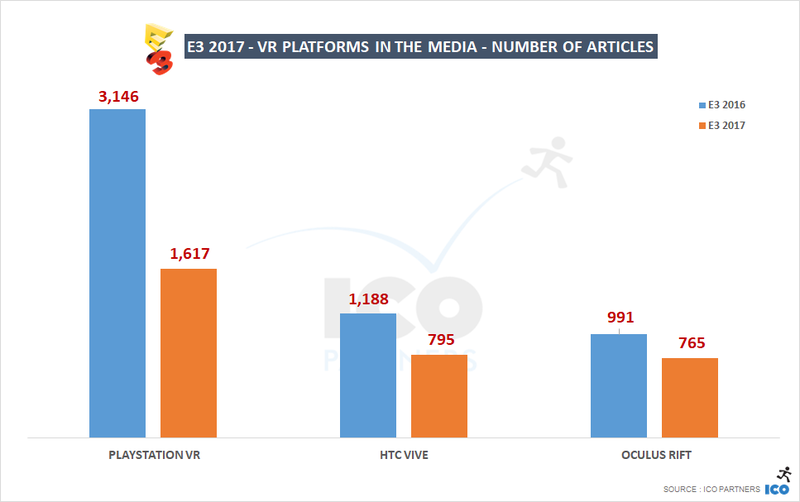 That's a steep decline, most likely due to the fact that the speculation on VR is now in a different phase, with all the devices on the market and being known quantities. [This was what was initially written in the article]ÂÂ EA didn’t do as well as last year. At that time, they had two games that had more than 2,000 articles. This year, Anthem, their best performing game, doesn’t reach that threshold. It’s interesting to note that Anthem is the only newly announced IP on the list. 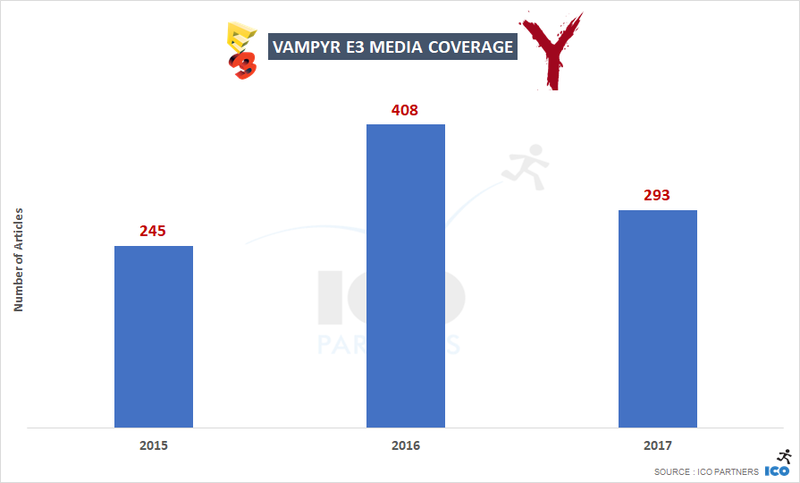 There were 3 publisher-powered press conferences this year, with Square Enix skipping it again this year. Ubisoft, after three years of growth, is finally coming on top, in large part thanks to the Assassin's Creed Origins coverage. 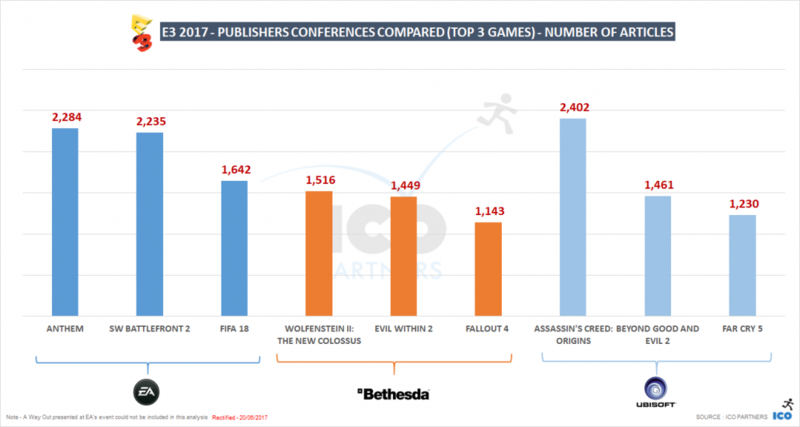 Bethesda did OK - the two new games obviously getting most of the coverage. But the really strong IPs of the publisher, Elder Scrolls and Fallout, had no revolutionary announcements around them, and in that respect, Bethesda still performed quite well considering. 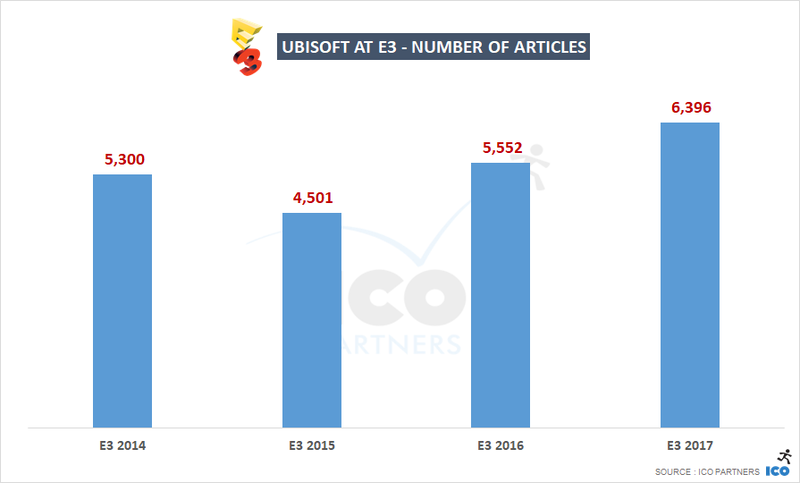 Finally, Ubisoft's conference was praised by many attendees and analysts as the best of the show. It had a wide range or projects showcased, an unexpected number of new projects revealed. The lineup was very strong, and then Ubisoft also managed to throw a few curve balls. 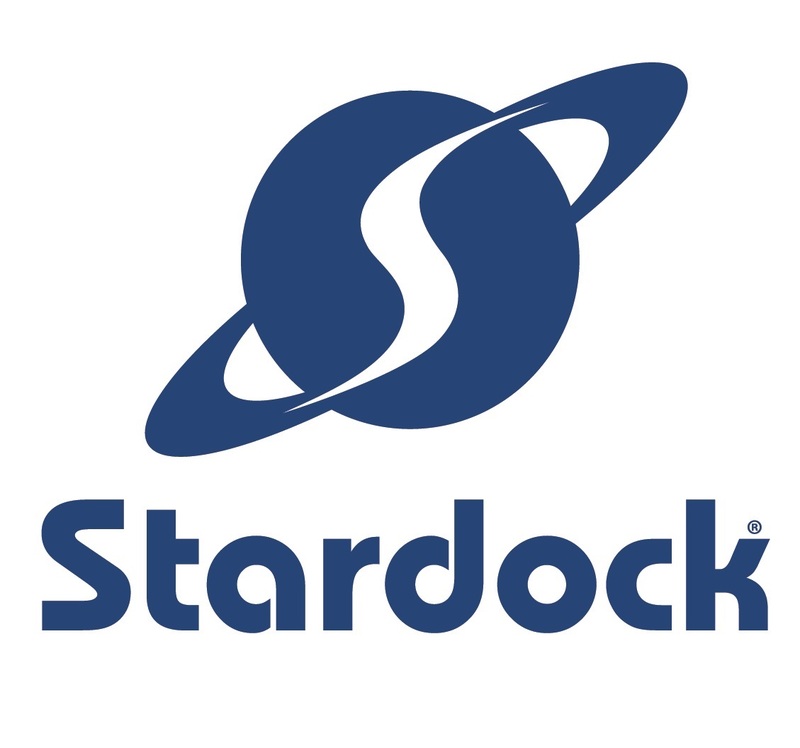 The fact that they're going after the declining toys-to-life market with Starlink was totally unexpected, for instance. No short selection of games for this year's case studies. Instead, I looked at how 2 games' coverage evolved year-on-year, and how two games from Klei compared to each other a year apart. Its first year at E3, the game wasn't featured at any conference, and it had a very decent coverage considering. This year is the last one before the game releases. The date has been announced, a feature video was released the previous week (and thus mostly absent in the numbers above), gameplay was at the center of the communication at this E3's beats. A strong coverage overall, even if not in the range of blockbusters. These projects by Klei are very interesting to compare: they were both revealed at the PC Gaming Show. 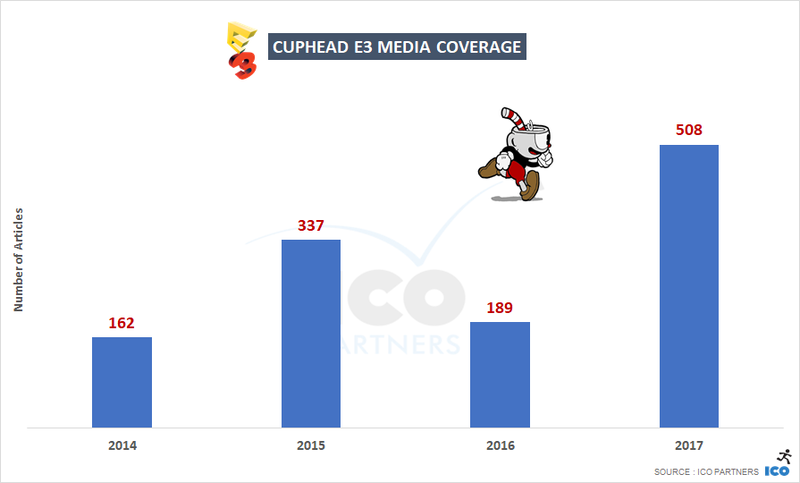 It is very difficult to get comparable data over time, but this is quite interesting - two games by the same developer, announced at the same conference at E3. I haven't shared data over the PC Gaming Show in the past, and it is mostly because the branding is not as strong and many announcements get relayed without mentioning the event. The fact that a games media outlet is attached to the event as the organizer might play a significant part too. 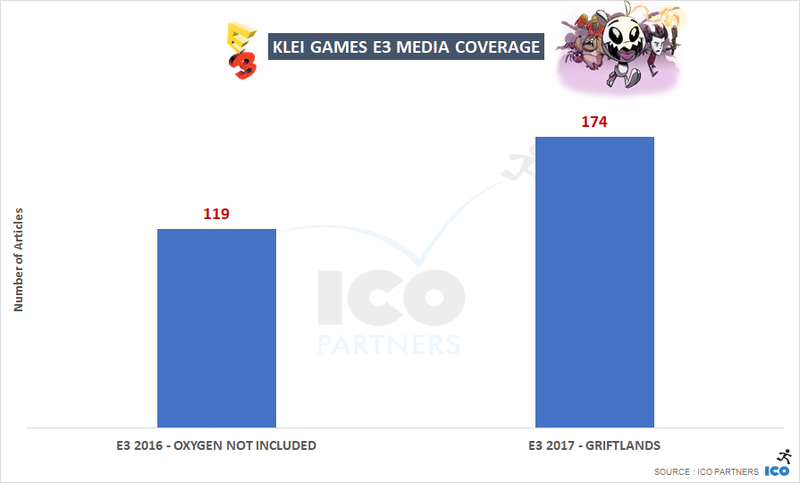 Anyhow, there is evidence of growth in coverage for games featured at this event, and Klei's games illustrate this quite nicely. I have always felt a bit conflicted about titling these articles "Who won E3?" as there is much more to the data than that. However, this year's E3 is a bit of an exception. The announcements made, the reaction of the media to them, the progress of the media coverage over the past few years; all of this make me want to declare two, very complementary "winners". 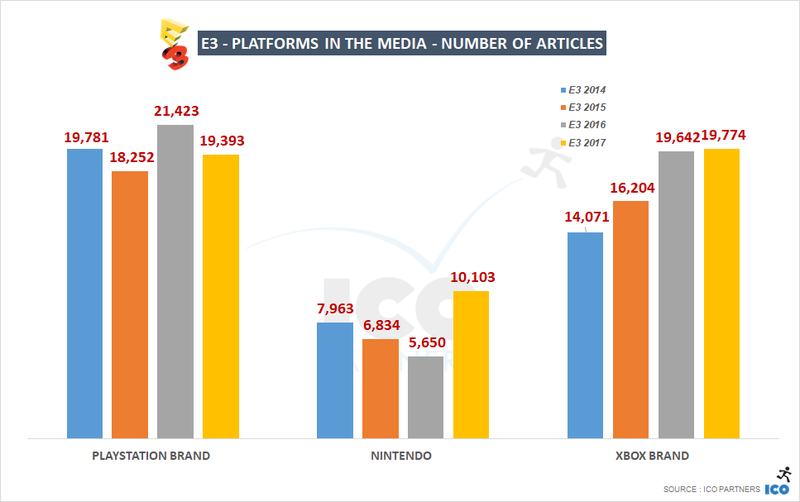 Nintendo - as they come back into the spotlight and significantly increase their media presence, this has certainly been the best E3 in years for them. Ubisoft - with their numerous announcements, the way they were orchestrated, and the stellar execution of the Beyond Good and Evil 2 trailer release, all explain how they ended up as the leading publisher of this E3 in terms of coverage. And I want to think that the two companies' partnership also played a big role, and is probably not a coincidence considering the position they both have at present in the industry, and their respective challenges. In the graphs on consoles over the past 3 years, I am comparing the PlayStation and Xbox brands to Nintendo. The fact is that the other consoles have consistent brands whereas Nintendo machines areÂÂÂ using multipleÂÂÂ brands. Moreover, Sony and Microsoft are two companies with activities spread across multiple industries and cannot fairly be compared to Nintendo, when we look at articles on games. 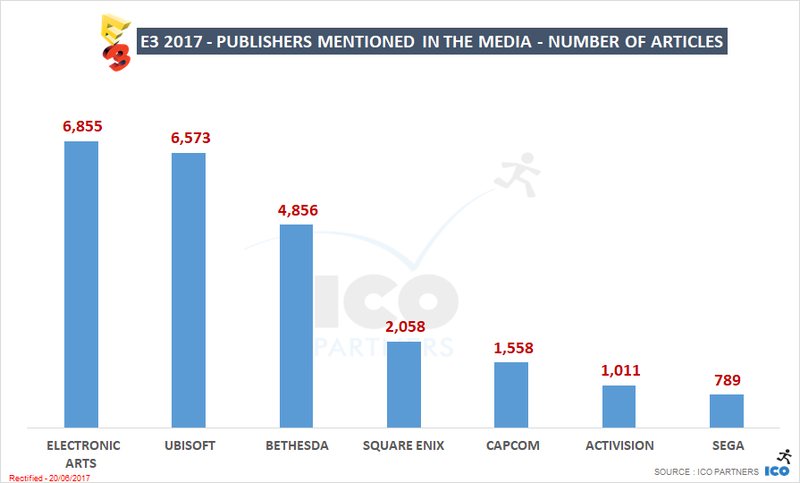 Nintendo is also a strong publisher, and its brand is more established than one of its consoles, compared to Sony and Microsoft. Comparing platforms to brands is the best way to have comparable results to look at the Nintendo brand, rather than the Wii for instance (or even a combination of the Nintendo consoles). The following graph requires some pre-explanation.ÂÂÂ In order to measure the magnitude of an article, with haveÂÂÂ created a formula based on the websites’ Alexa ranking to give their articles different “weight”. The more popular the website, the more weight we give to their article. This value is called Reach in our tools and range from 0.1 to 10. For example, currently, Eurogamer.net has a reach of 10, Gamasutra.com has a reach of 8, Road to VRÂÂÂ has a reachÂÂÂ of 6. So what you see below,ÂÂÂ is a chart of the total reach of all the articles showedÂÂÂ above. We refresh the reach values constantly.